Dr. Harold Medford: None of the ants previously seen by man were more than an inch in length - most considerably under that size. But even the most minute of them have an instinct and talent for industry, social organization, and savagery that makes man look feeble by comparison. Q: Is "Them!" based on a book? Q: Was that really Leonard Nimoy? Weird deaths are occurring in the New Mexico desert, it is revealed to be the work of giant mutated ants born out of the A Bomb tests that took place there. 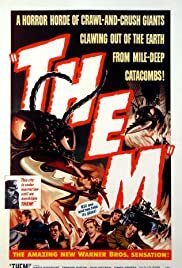 Trouble escalates to the big city of Los Angeles when one of the giant queen ants escapes to L.A. and starts laying eggs that could lead to the end of mankind as we know it.